Rabbit anti Mouse, Rat MIF. Synthetic peptide surrounding amino acid 67 of human MIF. 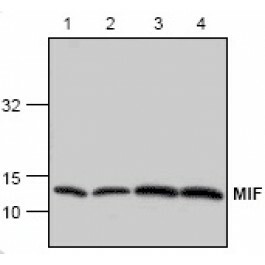 MIF (macrophage migration inhibitory factor) was one of the first cytokine activities to be discovered and was initially described as a T cell-derived factor that inhibits the random migration of microphages. Recently, MIF was rediscovered as a pituitary hormone that acts as the counter-regulatory hormone for glucocorticoid action within the immune system. MIF was released from macrophages and T-cells in response to physiological concentrations of glucocorticoids. The secreted MIF counter-regulates the immunosuppressive effects of steroids on immune cell activation and cytokine production. MIF also plays a critical role in the host control of inflammation and immunity. 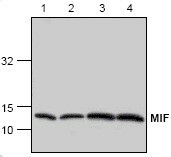 100 µg (0.2 mg/ml) affinity purified rabbit anti-MIF polyclonal antibody in phosphate buffered saline (PBS), pH 7.2, containing 30% glycerol, 0.5% BSA, 0.01% thimerosal.